Kristen Stewart meets a wall of cameras at Cannes, May 2016. Photo by Pascal Le Segretain. The Cannes Film Festival is underway and while checking out pictures of the first photo call I realized that for once I liked something Kristen Stewart wore! She normally looks miserable at these things and I can never tell if it’s because she hates seeing so many cameras focused on her at once, which I can appreciate, or if she despises what her stylist made her wear. She never seems to be wearing anything she really believes in or can somehow make her own. But this is one time I actually believe an outfit on her and she appears to be having a good time as well! I love Kristen in this very ladylike Chanel pencil skirt, which looks to be knit (or maybe a very lightweight tweed? Weigh in if you know), and has a gorgeous embellished trim at the hem and two silver buttons in the kick pleat. J’adore! I also love that she both edged it up and made it more youthful by pairing it with a pocketed and cropped T-shirt (I would like it even more if it turned out to be a $5 number from H&M). Love the buttons on the back and the hem of the skirt. I am also crazy for the sky-high stilettos by Christian Louboutin with the black and white print and the gold heel. I know her stylist made her wear those but I love them anyway and Kristen, who, when not working, can usually be found in skinny jeans and Converse sneakers, apparently does have some high heel skills since it seems she can actually walk in these! Crazy high heels but I love the print. Photo by Pascal Le Segretain. Love the mixed metals of these necklaces. I also like all of her jewelry. I know the watch and ring are Chanel, but I’m not sure about the chain link necklaces, one with a padlock (so great on Kristen), though I’m guessing they are Chanel too. I am not a fan of the huge tattoo on her inner right arm, but I do like her hair and makeup, since they also seem like something that is true to her actual style. Even the makeup is perfect for Kristen. 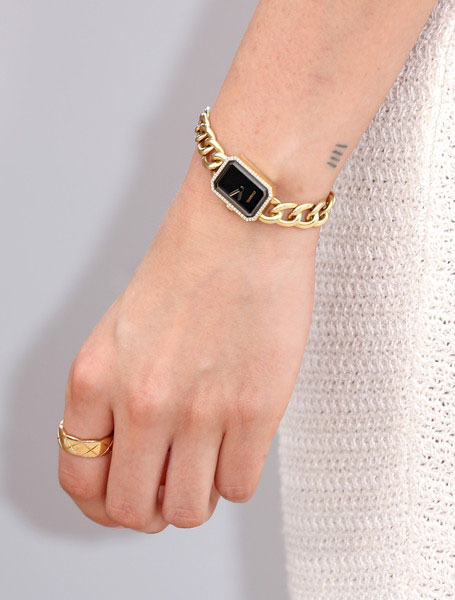 Great shot of the watch and ring, both by Chanel. Finally a smile from Kristen at a photo call! I think her best accessory is just the fact that she appears to be enjoying herself at one of these events. She is young, beautiful, and a big star, so why not relax and have fun with it?! Let me know what you think of Kristen’s look here. Except where noted all photos by Andreas Rentz of Getty Images Europe. I haven't seen enough of Cannes to know what the atmosphere is. What time of day? What is everyone else in. Love the skirt with that texture...don't much like the T but if it's beach resort informal then it's ok. I absolutely hate tattoos but realize I'm prehistoric on that and many other things. I am far more interested in the grown-ups both at premieres and on screen. LOVE Kristen's look here .. chic & edgy! And she does look like she's having fun for a change too. I love that pencil skirt look too! I agree Stewart never looks happy and is rarely in such a polished look. The necklaces are nice but I would have liked to have seen more color or a bolder statement piece. Chanel has some fun lion or constellation jewelry that would have fit into this color scheme. But a real improvement for Stewart! Women don't ripen to GSL's taste until they're North of 35. Love the jewelry, the skirt, the shoes even the makeup. But the hair looks too bleached out & in need of TLC. Like her better as a brunette. Kristen is yet another actress who played a young Chanel in Lagerfeld's movie Once ^ forever. I actually love this whole look. Cropped topped tee and pencil skirt for the win!! I really like how she did a mixed-metal jewelry situation, too. I would totally wear this! It's a nice look. The shoes are a good choice.